5-6: Significantly clearer path to victory for one person. Possible side bet. 7 – Strong confidence. Bet worthy. 8-9: Extremely confident. Foundation bet worthy. 10 – If I’m wrong, I question everything I know, or I think the other fighter winning must be because of something indisputably fluky. The opening bout of the main card will feature two young Coloradans, both riding win streaks. In Barber’s case, she has yet to ride defeat, while Alrdrich has won three straight, with her last loss coming to Juliana Lima in 2017. Maycee Barber will bring many weapons into this flyweight encounter, but at 20 years of age, there are questions as to how honed they are. Aldrich will be an appropriate barometer to gauge how far along Barber is. If you ask Barber, she will not need much time to be elite, or even the best, what with her publicized ambitions of becoming the youngest champion in UFC history. Barber fights like a competitor who is constantly looking to make statements, with tenacious grappling and debilitating strength that is most pronounced in the clinch and takedown attempts. Always looking for the finish, Maycee Barber’s has earned three stoppages from ground and pound. JJ Aldrich’s path to victory will be to use technical striking and distance control throughout the fight to ensure that Barber does not outgun her. Aldrich fights with a sense of composure, and she is going to need it, particularly early on when Barber may fight with peak aggression. The jab of Aldrich is a bullet point for an Aldrich game plan that could take a decision for her, as well as a counter-striking approach to the fight, highlighted by a right hook that has worked well for her in the past. I expect Barber to enter the fight as the hungrier, stronger, more aggressive fighter who will likely be fighting for the finish. Barber has only gone to decision once, so a finish is a strong possibility. And should she not earn the finish, her aggression should be enough to earn a decision. Therefore, Maycee Barber is the fighter with more path to victories in this contest. Just one look at the record of these two gentlemen and the first thing that leaps out is the disparity in experience level. But will it matter? Six fights or not, Luis Pena is a well-rounded martial artist training at the legendary American Kickboxing Academy (AKA), including sparring sessions with the likes of reigning lightweight champion Khabib Nurmagomedov. Luis Pena has enough experience to know when to work the body and when to continue peppering his opponents with one-two combos from the end of his long arms. Luis Pena is an intruding stalker who fights with confidence and swagger beyond his years. But yes, the experience will matter in this fight. Steven Peterson is not an easy individual to control, nor is he easy to put away. Should Luis Pena win, it will likely be due to outpointing Peterson. The problem is, Peterson is relentless and can be expected to continue pressuring Pena throughout the contest. I expect Peterson to show the difference between the will of a young lion and that of a hunter that has tasted blood many times over: that of his own and of his victims. Peterson could specifically look to use his grappling should Luis Pena get the better of the striking advantage. At 6’3 and making his debut at 145, there are also a lot of questions as to what Pena’s health, energy, and gas tank will look like. Luis Pena is clearly a talented guy. He wouldn’t be in the UFC fighting a guy with 24 fights while only being six fights into his own career if he weren’t. But for this fight, there appears to be more questions on his side of the bout. In the end, though, I’m going to expect the fight to look similar to the Brandon Davis fight, only closer. And while I expect Peterson’s experience advantage to present itself, I still expect Pena to outstrike Peterson, even if he drops a round in the process, and take home a close, maybe even controversial decision. Will Deiveson Figueredo suffer his first loss to the man who currently sits as the #1 contender of the flyweight division? For the answer to the above question to be in the affirmative, Formiga should look to get the fight to the ground, where he should have the advantage. Formiga is a black belt in Brazilian jiu-jitsu with nearly half of his 22 victories (10) coming by submission, including two of his last three fights in the UFC. But where Formiga shines on the mat, Figueredo should outshine him everywhere else. Deiveson Figueredo is a bully unafraid of his victim fighting back. It’ll only just make him bully harder. Punch stronger. I expect Figueredo to look to walk Formiga down throughout the fight, waiting to land his big uppercut if the opportunity presents itself, and up his volume if and when he smells blood. The flyweight division is often criticized for not enough finishes, but thus far only one of Figueredo’s four UFC fights have gone to the judges. This is a dangerous fight for both competitors. It would be easy to fall in love with the flashy undefeated fighter, but if Formiga has Figueredo controlled on the mat as long as Jarred Brooks did, it becomes easy to see a Formiga finish. Formiga is primarily a counterstriker, and that is just not a winning approach against Deiveson Figueredo. Formiga would be wise to continue to shoot for takedowns throughout the fight, but that is not his natural fighting style. In the end, I believe that Figueredo’s advantage on the feet and common-sense coaching will win out, and Formiga’s strategy will be to take the fight to the mat. Eventually, I expect him to be successful. And when he is, I expect him to then earn the upset submission victory to solidify his place as the #1 flyweight contender. Despite being 11 years the senior of Jesus Pinedo, John Makdessi only has one more fight of experience under his belt than his opponent at UFC Nashville. Jesus Pinedo is a short-notice replacement for this bout, as Makdessi was originally set to face Nasrat Haqparast at this event but will now take on Jesus Pinedo, who defeated Devin Powell in his UFC debut. This fight is a classic case of miles vs. age. Both fighters have the same miles, but at only 22 years of age, Pinedo should be considered the fresher fighter. Pinedo is very capable of attacking in flurries and disrupting Makdessi’s counterattacks. He also has a good body kick, and he has a sneaky pop to his punches. Although he has nearly the same amount of fights as Makdessi, there are levels to this game, and it shows at times in Pinedo’s skill set. Pinedo’s head movement and striking defense is very awkward at times, and he leaves many openings to exploit. Pinedo should look to use his six-inch reach advantage in the bout, but I expect Makdessi to nullify that advantage with his more refined striking, effective counter-punching, and overall greater striking versatility in a bout that I expect to remain standing. This fight comes down to one question that the public simply does not have the answer to: how good is Justin Willis’s takedown defense? We don’t know. We have never seen it. What we have seen is the hand speed of Justin Willis, however, which is one of the quickest in the heavyweight division, and quicker than Blaydes’s. We’ve also seen the fluidity of Willis’s striking on the feet and his composure in both calm and stressful situations. As for his takedown defense, all we have to go on is the fact that Willis trains at AKA and spars with Daniel Cormier and Cain Velasquez. But it is fallacious to believe that just because he trains with high-level wrestlers that he has transformed into a high-level wrestler or high-level defender of wrestling. On the other hand, it is reasonable to assume that Curtis Blaydes is more likely than not to score a takedown against a fighter whose takedown defense sample size is 0. If you were to tell me Curtis Blaydes is going to fight a heavyweight that has no wrestling background and no sample size for takedown defense, but just happens to train at AKA, I’d take my chances. Because what I do know is that Curtis Blaydes does have a wrestling background and has scored takedowns in nearly all of his professional fights. Furthermore, Curtis Blaydes has underrated striking to where he could potentially edge out a decision, even if all else fails on the takedown front. But I do expect Blaydes to score the takedown. Because even without the sample size, Justin Willis is not very athletic and, when it comes to overall body movement, is not particularly quick. Therefore, Blaydes will most likely close the distance on him. The question is, when he does, will Willis be able to stuff the takedown? I don’t think he will throughout the entirety of the fight. If Willis does stuff the takedowns, I expect that to drain his gas tank eventually, and that will open up all kinds of avenues for Blaydes to exploit both on the feet and in additional takedown attempts. 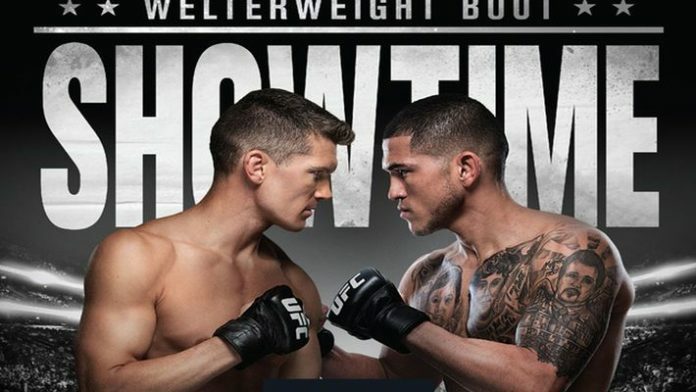 Both Stephen Thompson and Anthony Pettis will be looking to return to the win column in this main event. Anthony Pettis, who will enter the fight as the large undergog, has alternated wins and losses in his last six fights and will now try his luck in the welterweight division. I do agree with Anthony Pettis in believing that weight will not play as much of a factor as many are making it out to be. I believe that the most likely way this fight will play out is a point-striking battle with neither fighter dropping, in which case weight will be irrelevant. However, Anthony Pettis is a veteran of the game and has one of the most respected head coaches in the game in Duke Roufus. So this fight has what I’ll call “trap strategy” written all over it. A trap strategy is most commonly seen when a fighter says he is going to do one thing in a fight, but then does something completely different. One example of a trap strategy coincidentally involves Stephen Thompson’s most recent bout against Darren Till. Darren Till went on and on about how he was going to bumrush Stephen Thompson and look for the first-round KO and how aggressive he was going to be and blah, blah, blah. Come fight night, we see a technical chess match that both surprised and disappointed many fans, and yet it earned Darren Till a victory, which is all that matters. Most fans, myself included, are expecting a striking battle between these two, and Anthony Pettis is not doing much to quell those expectations, saying that their fight will be a battle of karate vs. taekwondo and that he will “swing for the fences” in the fight. Now I don’t know what Anthony Pettis and his coaches are planning to do, but they would be wise to take advantage of a “trap strategy” and swerve both Stephen Thompson and the public. If I’m Anthony Pettis’s coach, I tell him to play the point-fighting game for a round, maybe even two rounds. Lull Stephen Thompson into a false sense of comfort that the fight will be a technical striking contest while throwing extremely little volume so as not to give Thompson an opportunity to use his consistent counter-striking game plan. Then, in the middle of round three, suddenly shoot for a well-rehearsed takedown, hoping that the element of surprise will get it for you. At that point, Anthony Pettis should look to use his very underrated jiu-jitsu game to earn a submission. And whether or not Pettis gets that submission or even whether or not he gets the takedown, he should continue to attempt to turn it into a grappling contest for the remainder of the fight. That’s how Anthony Pettis wins that fight. But I don’t think that’s what’s going to happen. I think the fight will be as it appears: a standup fight that will favor the much more decorated striker in Stephen Thompson, who may even earn the finish. Even if Pettis does shoot for a takedown, Thompson has strong takedown defense and would likely keep the fight standing. Thompson is not one to underestimate his opponent or alter his game plan or fighting style based on whom he is fighting, and I expect him to use his length, striking experience, and masterful counterfighting game to win the fight, and possibly even put on an absolute clinic. Read more from Clyde Aidoo on the MMA Logic Facebook and Twitter pages and be sure to stick with MMANews.com for live coverage of UFC Nashville, including results, highlights, and more!